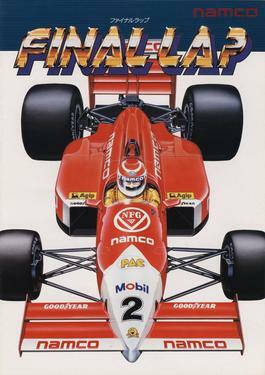 From the makers of Pole Position, now there's Final Lap: The final word in driving games! Imagine yourself racing head-to-head against the player sitting next to you. You see his car approaching in the rearview mirror, and suddenly, he passes you on the inside, narrowly missing a road sign. You weave between the other competitives cars in hot pursuit. 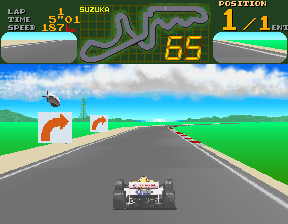 You are on his tail through the hairpin and pass him in the straight-away! The status screen tells you that you are now in first position. You pass the finish line before the time runs out and again get extended time, but the question still remains: can you complete the final lap?